For fans of Mexican cuisine in Hyderabad, La Cantina has always been a favorite destination. 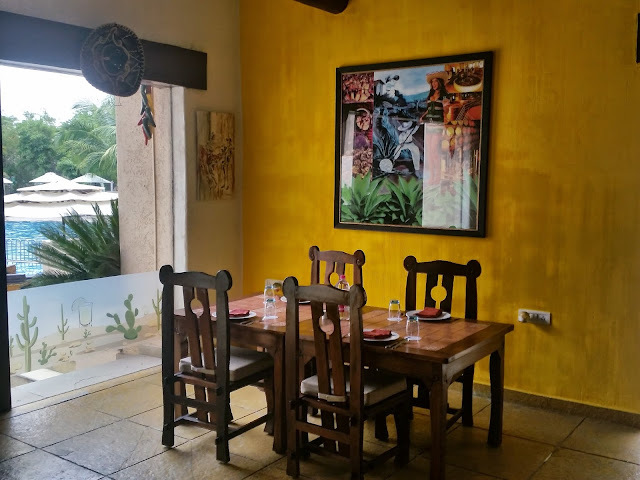 Though there has been few other Mexican and Tex Mex restaurants in the city, this pure Mexican restaurant at Novotel HICC is known for not deviating from the authentic Mexican taste in their preparations. The restaurant has recently crafted a new menu with many interesting choices. I was invited to sample the new menu, and visited the restaurant just at the poolside at the hotel. On a summer afternoon, we avoided the poolside al fresco seating and made ourselves comfortable at the dining area inside. The place indoor has a typical Mexican décor with items and motifs from Old Mexico. The furniture is essentially heavy wooden and quite comfortable. 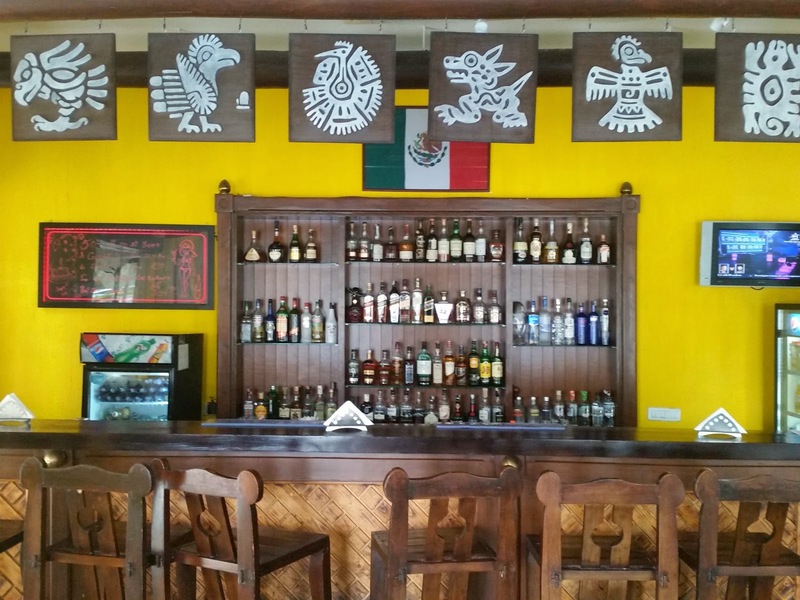 As you enter you find a large bar in front ready to serve you their margaritas, mojitos and the tequilas. I had a look at the new menu. It made an interesting read – the first page traces the history of Mexican cuisine starting from Mayans and Aztecs and subsequent Spanish influence after their invasion. The menu itself is not very long, but the items are fairly exclusive. A chef’s choice set sampling menu had been laid out for us. As we waited for the listed items we feasted on the corn chips laid out on the table with salsa, sour cream and guacamole. The dips as well as the salsa were detectable. 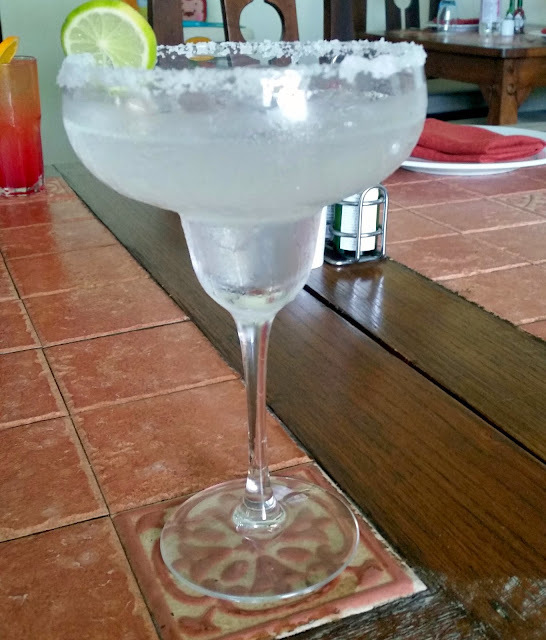 A well-made Classic Margarita served as the perfect drink for the occasion. The Antojitos were first to arrive. Chef Saurav had prepared two sets of starters – vegetarian and non-vegetarian. 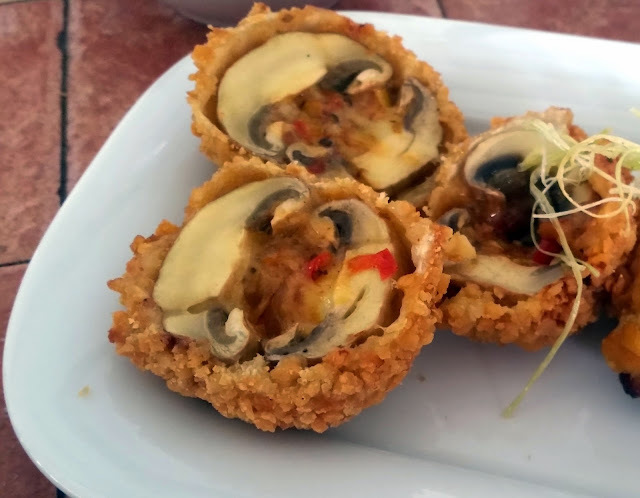 Among the vegetarian starters the Mushroom Rellenos were easily my favorite – mushrooms stuffed with chipotle, jalapeno and ancho peppers, and fried with a coating. The Flautas (or flutes) of tortilla filled with ricotta cheese was another one with a distinctly different taste. 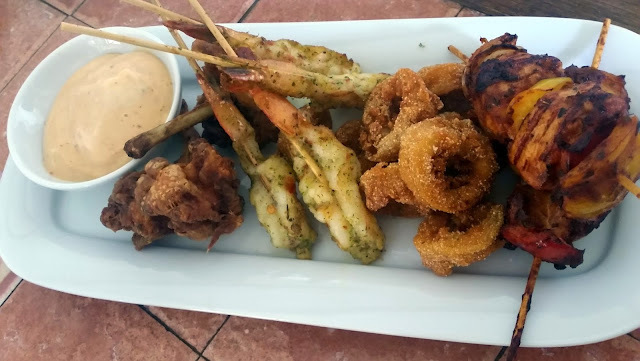 The non-vegetarian platter had Crispy Chicken Wings and Garlic flavored Grilled Prawns. The Yucatan Chicken Skewers had chicken marinated in chipotle paste. This was spicy and would suite the local palate a lot. The star of the platter was Aztec Calamari – soft and succulent squids crusted in Masa Harina or corn dough. The soup of the day was Chicken Pozole – a slow cooked chicken and chickpea broth. 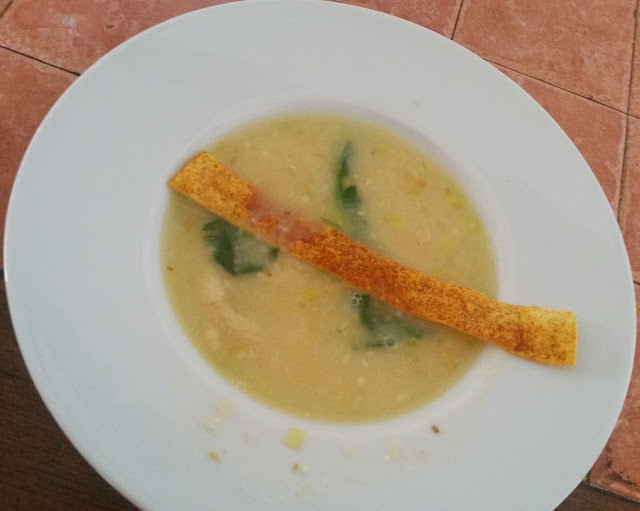 The chef told me that in this soup bread crumbs have been used as the thickener, which gives a different texture to it. It had a very distinct taste which was further enhanced by the small bacon bits I was advised to add to this. I would definitely place this soup in the must order category. Meanwhile, my margarita was replaced by a Flaming Mojito – a mojito with white rum set on fire before adding to the syrup. The first sip itself made me happy with its flavorful and strong taste. 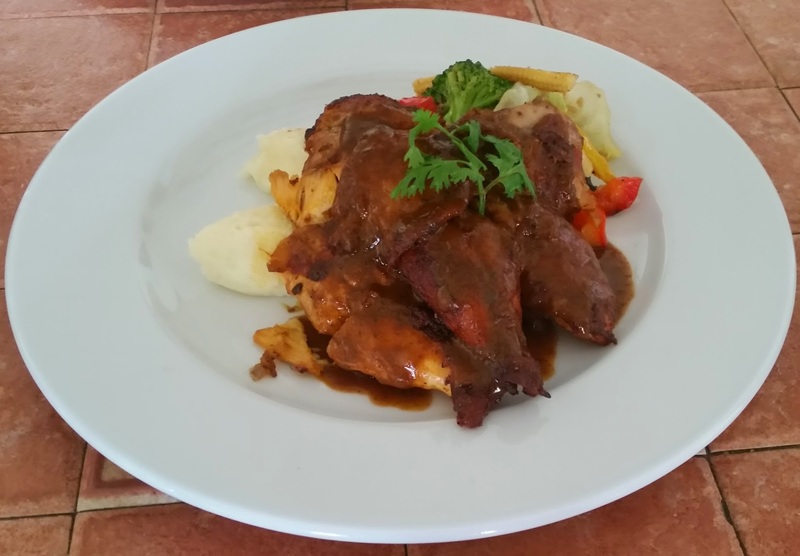 The main courses which we tried out were the Yucatan Roast Chicken, a delicacy from the Mayan area of Yucatan. The food from this area is supposed to have least Spanish influence. The roasted chicken was served with a nice peppery gravy on top with sides such as sautéed vegetables as well as mashed potato. The combination worked for me and made dish definitely worth raving about. Lucas Prawns and Pepper Brochettes were no passover either. 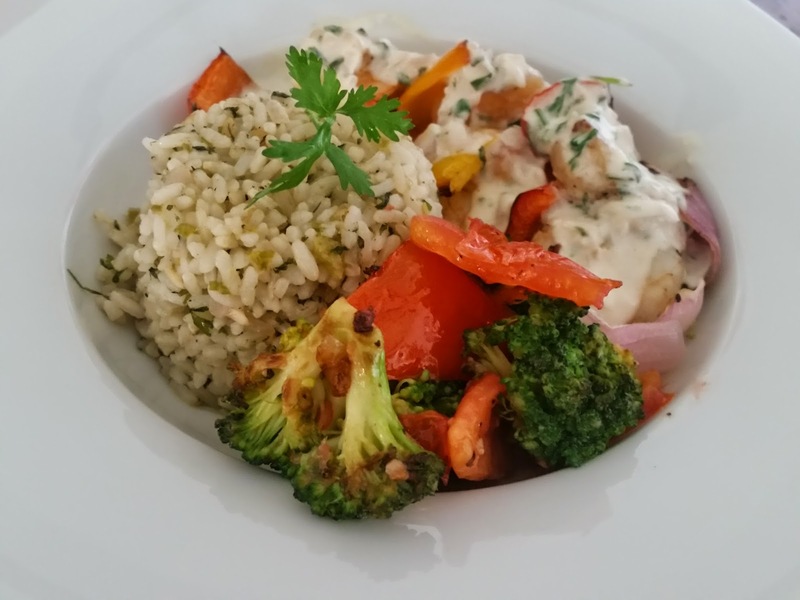 Served with flavorful Cilantro Rice and broccolis and pepper, it surely tickled our taste buds. We also tried another of their fried specialities – the Pulled Pork Chimichanga. Though I was fairly full by then and wanted to keep some space for the desserts, the pork filling was so delicious that I kept on nibbling at it. Finally it was time for desserts. 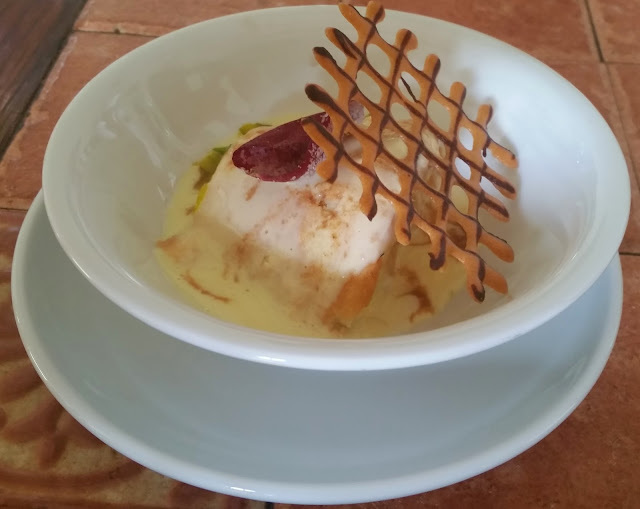 Chef served Tres Leches, a butter sponge cake soaked in three types of milk – praline, double cream and condensed. As someone pointed out it was kind of Mexican version of Shahi Tukda – the soaked sponge cake was a delight to those with sweet tooth. 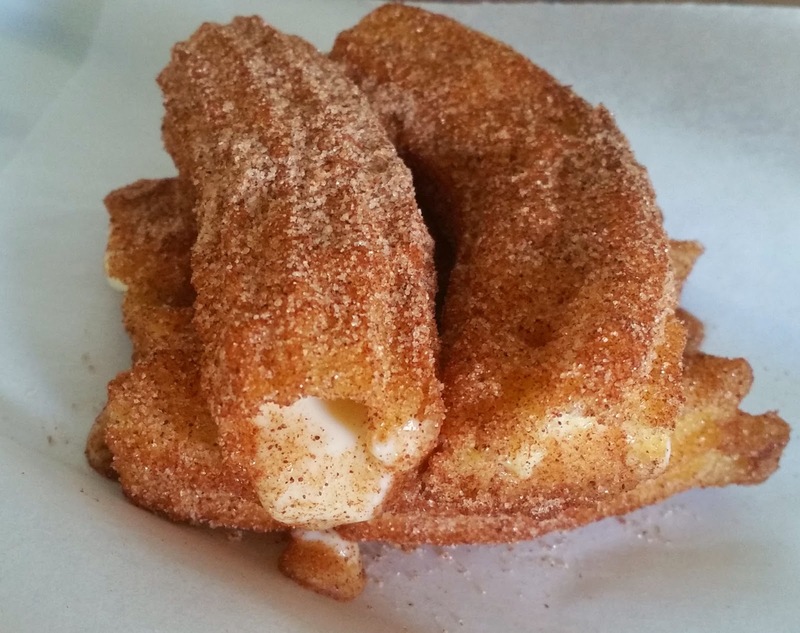 The Churros that followed were special – a bite into it and pastry cream oozes out, which have been used as stuffing inside. 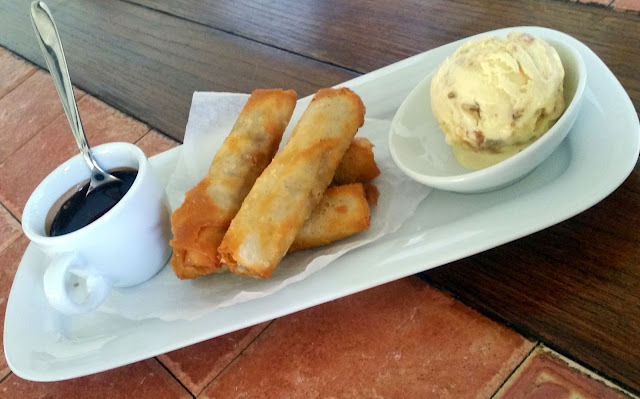 And finally the best of the lot – Dulce De Leche Wraps with a banana based filling which we savoured dunked in chocolate sauce and accompanying butterscotch ice cream. All the three desserts were outstanding, thus providing a very rich experience for sweet lovers. 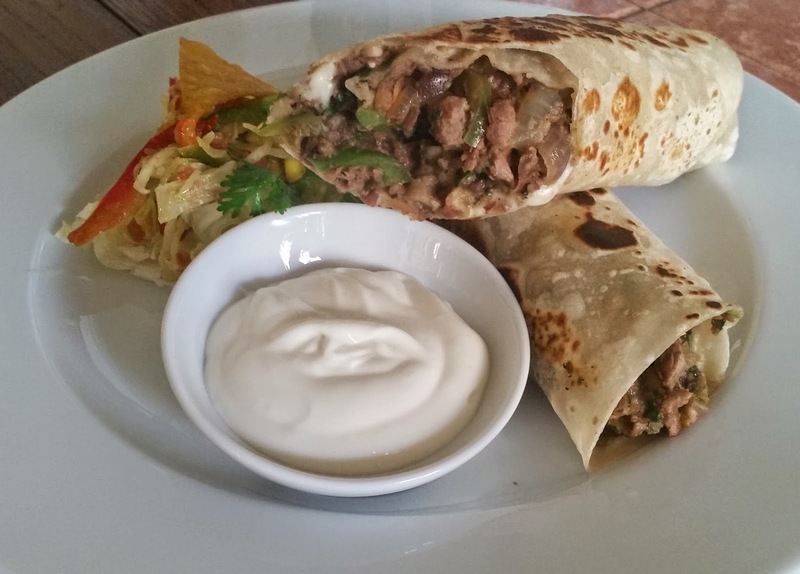 The new menu is refreshingly different from what you generally get in the Mexican restaurants. A lot of research has gone into its planning, and the items have been carefully curated after a lot of discussions and tasting sessions. Few items which were not on the sample menu, but looked interesting to me were Crab Elote (a cream based crab, pepper and corn soup), Jalapeno Chili Beef and Fish in Veracruz Sauce. Plan to try these out on my next visit.